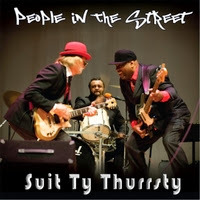 I just received the newest release, People In The Street, by Suit Ty Thurrsty and it's quite unusual. Opening with I'm Never Gonna Leave You STT sets a basic jazz rock groundwork. Featuring Tyree "Ty" Pope on vocal and bass, Pedro "Thurrsty" Johnson on vocal and percussion and Tom "The Suit" Forst on vocal, guitar and keys these guys mean business. Diamonds is an unusual blend of the Classiv IV, Hendrix and Frank Zappa. A little of something for everyone. People In The Street has a really cool bass/drum/guitar groove and Living Color like obtuse lead work. Same Old Song has a definite blues riff with a Leslie West edge. Darkest Before The Dawn is a clean and clear cut blues rocker. Nice. I Got The Blues is an uptempo blues rocker with Forst adding keys complimenting his lead guitar work. You Make Me Feel Real opens with a cool bass/drum riff. Forst takes a slick guitar detour on this track playing aginst some funky bad vocals. With a R&B feel this may be the best track on the release. Drawers has a real guitar sting and although blues based, more of a heavy hand along the lines of Leslie West with vocal harmonies like you may hear in some heavier tracks. Mama (What's A Man) is a quieter ballad with searing multilead guitar work. I'm Already Against The Next War maintains the course with a blues rock anthem along the lines of Mahogany Rush or Eric Gales (not that STT sounds like anyone in particular but these are comparisons that I can draw in my mind). I See Your Future takes it to the next level with a Chili Peppers feel but still retaining the guitar rock style. A bonus track, Same Old Song is added to the end with a cool more instrumental flavor. The funky edge and guitar riffs add a different flavor.